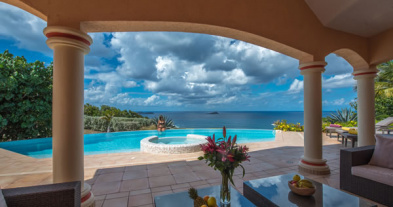 Villa ECLIPSE is luxurious and architecturally innovative. Its design is based on clear-cut straight lines and angles, combined with the extensive use of natural materials. 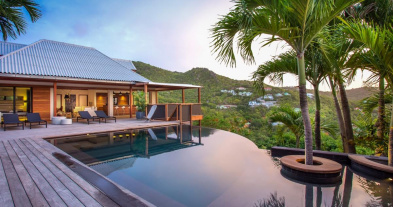 Perched on the hill of Camaruche, Villa ECLIPSE offers a panoramic view of the landscape of St Barth, Tortue Island and the sea in the distance. 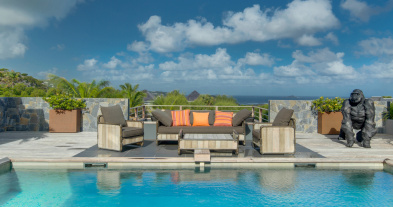 Its chic and modern architecture, as well as its contemporary decoration, make it one of the most renowned villas on the rental market in St. Barths. The huge lounge and gigantic terrace make the pool area the perfect place to meet, and also offers upscale cuisine worthy of the greatest chefs. All you need to do is close the large windows, to find yourself comfortably sitting in the beautiful sofas and watching a movie with your family. The beautiful infinity pool is large enough for a "real" swim, and the deck that surrounds it offers plenty of sunny space. Dispersed around the pool, a variety of rooms are available to you; Which goes from the Creole cottage with four poster bed and separate bathroom, to the master bedroom, spacious, opening onto the pool area, two bedrooms side by side with a splendid sea view even bathrooms, on the lower level, one another bedroom can be set up as a single or double bed and the last one has a private terrace with a shaded garden. All have sea views, and elegant bathrooms. There is also a gym with sea views, and if you need action, the Grand-Cul-de-Sac Nautical Center is just a short drive away. Supermarkets and restaurants in Lorient are also nearby. Villa ECLIPSE is a perfect choice for a gathering of a large group of family and friends. Please note that a 4WD Car is highly recommended. Large open living area, HDTV, French Satellite, Dish Network,DVD player, IPod Dock station, WIFI, Sound System, Phone, Ceiling fan. Fully equipped Kitchen, Fridge, Freezer with Ice Maker, Wine storage, Dishwasher, Oven, Microwave, Gas cooker, Coffee machine, Nespresso Machine, Toaster, Ocean view. Euro King size Bed, Ensuite Bathroom with shower, double sinks and toilet, Safe, Dressing room, Air conditioning, HDTV, Dish Network,DVD player, Pool view. Euro King size Bed, Ensuite Bathroom with shower, Air conditioning, Closet, Safe,TV, DVD player. Euro King size Bed, Ensuite Bathroom with shower, Closet, Air conditioning, TV screen. Queen size Bed, Bathroom in a separate Bungalow with shower,Double sinks and toilet, Air conditioning, Outdoor shower, Ocean view. Queen size Bed, Ensuite Bathroom with shower and single sink, Closet, Air conditioning, TV, DVD player, IPod Dock station, Private terrace. Queen size Bed, Ensuite Bathroom with shower, Closet,TV screen, DVD player, Air conditioning, Private terrace, Ocean view. Fitness room located next the fith bedroom, Elliptical Bike, Step machine, Bike, Free weights, Air conditioning, Ocean view. Heated pool, Sun deck, Deck chairs, Gas Barbecue, Ocean view.